Built for the Regional Jet Challenge. My second entry, medium jet. Range: 1850km (1050 fuel, Mach 0.85, 7000m, 0.15 fuel flow). Landing speed: To be determined. The Kalyani can be seen as the big sister of the Kira, most advantages and disadvantages apply. Thanks to its rugged landing gear and STOL capabilities, it enables lesser developed regions to boost their economy without having to invest in expensive facilities like airfields. While there are more parts to maintain than the competition, it’s all off-the-shelf proven technology which means the average mechanic doesn’t have to be certified for custom parts, lowering costs on the other end. It also means replacement parts can be found anywhere, even lying by the side of the road. Take off: Choose take off configuration, (AG9) toggles taildragger, (AG0) toggles tricycle (double tap first time). Toggle flaps, start engines and go full power. Do not switch on SAS and do not touch the controls! When it’s in the air, let it pitch up to 30 degrees, then retract flaps and take control. Normal flight: center of mass shift is negligible during fuel burn. Unlike the Kira, Kalyani has no tendency to pitch up, to improve fuel consumption. If flying without SAS, trim needs to be used. Never extend the flaps at speeds higher than 60m/s! You and your passengers are not wearing G-suits! Landing: Advice is to land in taildragger configuration. Max pitch during landing in tricyle mode: 8 degrees. Best way to slow down for landing is to lower both landing gear sets and/or to use the thrust reverser (AG3). 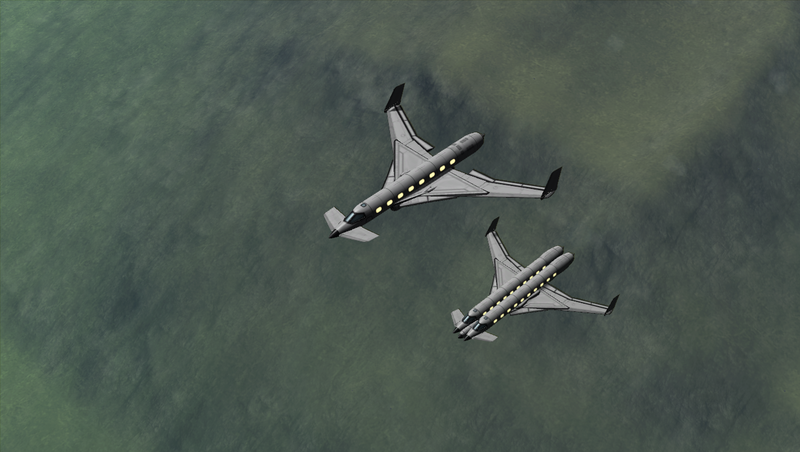 After speed has dropped below 55m/s, the flaps can be extended. Landing without SAS is suggested, for improved feedback. Emergency landing (engine failure or fuel starvation): lower both landing gear sets (mandatory! ), extend flaps. Try to maintain at least 57m/s during descent. Just above the ground, pull on the stick.